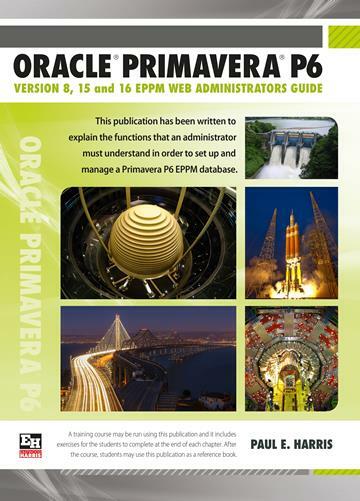 This publication has been written to explain the functions that an administrator must understand in order to set up and manage a Primavera P6 EPPM database. This publication may be used to run a training course and includes exercises at the end of each chapter for the students to complete. After the course, students may use this publication as a reference book. The book is aimed at assisting database administrators to understand how to configure and administer a P6 database after the software and databases have been installed. How to administer a P6 Database using the Web interface. This book is a PMI Approved course and instructors PowerPoint slide shows are available to training organizations. PMI REPs may apply to have this course licensed to them and award 14 PDUs to each attendee. It covers the Primavera Versions 8, 15 and 16 EPPM Web tool and the book is designed to show administrators in any industry how to setup an EPPM database. It explains in plain English and in a logical sequence, the steps required to create and maintain an EPPM database. It tackles some of the more complex aspects of the software that the user manual does not address. It covers the Primavera Versions 8 and 15 EPPM Web tool and the book is designed to show administrators in any industry how to setup an EPPM database. It explains in plain English and in a logical sequence, the steps required to create and maintain an EPPM database. It tackles some of the more complex aspects of the software that the user manual does not address. A training manual for a two-day training course. This book is written by an experienced scheduler, who has used the software at the sharp end of projects and is not a techo. It draws on the author's practical experience in using the software in a wide variety of industries.